Plymouth Leat is always linked with the local seafarer, Sir Francis Drake, and is sometimes referred to as Drake's Leat. He became Mayor of Plymouth in 1581 and was a Member of Parliament for various constituencies in the years 1581 (unknown), 1584 (Bossiney) and 1593 (Plymouth). He was in Parliament when the Act below passed through the necessary stages. 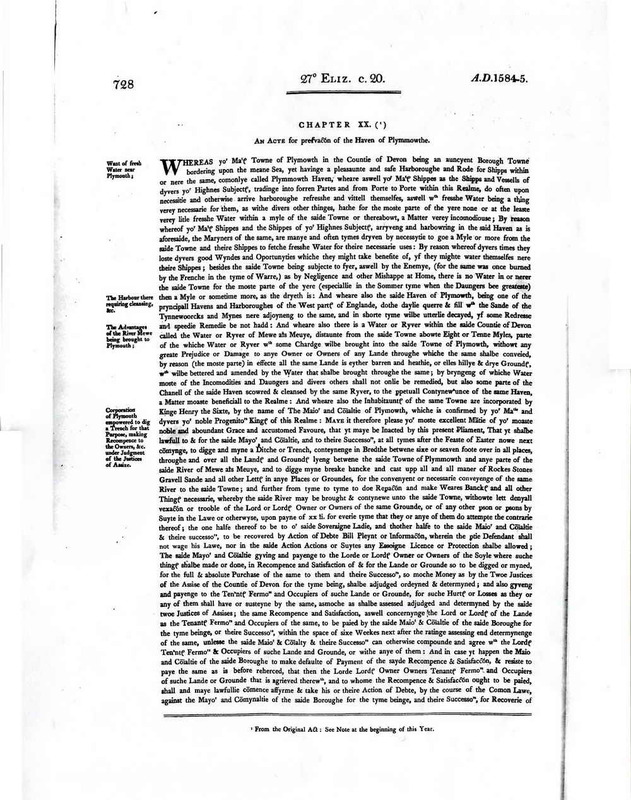 This image shows the first of 1½ pages. I am grateful for their helpful assistance in obtaining it and others. "..... and at all tymes after the Feaste of Easter nowe next comynge, to digge or myne a Ditche or Trench, conteynenge in Bredthe betwene sixe or seven foote over in all places, throughe and over all the Landf and Goundf lyeng betwene the saide Towne of Plymmowth and anye parte of the saide River of Mewe als Meuye, and to digge myne breake bancke and cast up all manner of Rockes Stones Gravell Sand and all other Lettf in anye Places or Groundes, for the conveyent or necessarie conveyenge of the same River to the saide Towne ..........."
HL/PO/JO/10/1/4 Main Papers 26 Feb 1593 - 24 Mar 1593 20 March 1593 -- Draft of "An Act for the explanation and true interpretation of a Statute made in the 27th year of the Queen's Majesty's reign, intituled An Act for the preservation of the haven at Plymouth." Seen near the bottom of the page under the date 20 March 1593. The origin of the leat was ¾-mile up the Meavy valley from the Burrator dam, at approximately SX 55430 68803 (derived from information in Bush, p.17) - this being some 60 yards (55 metres) from the end of a hedge marked by the modern inlet (now dry) from Devonport Leat. This was also the site of Head Weir Cottage, where the occupant was responsible for maintaining the weir, sluices and the leat generally. The leat was dug in five months, starting in December 1590, the delay was due to the war with Spain and its Armada etc (main battle near the Eddystone Rocks, Plymouth, 21 July 1588). The leat was completed in 1591 (Bush, p.11). A Dartmoor National Park notice informs that "Two gangs of workmen completed a mile per week" - with a length of 18½ miles it would have taken less than five months. Initially, it would have been just an earth ditch; granite linings and an improved bottom would have come later to reduce water loss by leakage. It was inaugurated on 24 April 1591, with great civic celebrations. Much of the leat was lined with granite slabs in 1871, just 27 years before Burrator dam and reservoir rendered the leat obsolete (Bush, p.20; Hemery, p. 113). Although the Act that enabled the leat stipulated that it was to flow into Sutton Pool to keep it free from silt coming down the river from tinning activities, Drake soon had it diverted to discharge into Millbay, via the Manor Mills that were leased by him from the Corporation, They were previously operated by the ebb and flow of the tides. This was another example of Drake's astute business acumen - he was experienced at sailing close to the wind - and beyond! Water was required for naval and merchant shipping. However, while the leat was finished in 1591, it was not until 1645 that water was supplied to any naval establishment (then at Lambhay Hill) and 1651 to shipping at The Barbican. This was 54 and 60 years later, hardly diligent compliance with the Act. Water was required for fire-fighting. However, the leat was too far from much of the town to be of any use for this purpose. Water was required to scour Sutton Harbour of silt from tin-working. However, the local merchants were at that time filling in and reclaiming land to build warehouses etc. rather than maintaining the harbour. Further, the route of the leat was extended without seeking permission from Parliament, although the leat probably still ran to Sutton Pool in 1847 as a "watercourse" was mentioned in the Sutton Harbour Act of that year (Hawkings, p.14-15)..
Water was required to improve the quality of Dartmoor land over which the leat was dug - as if the area didn't get enough rain: there was no such improvement undertaken. There was no mention in the Act of supplying water to the people of Plymouth - this was essentially a business exercise. The real intention was to bring in water to drive the Corporation's Manor Mill at Mill Bay, leased by Sir Francis Drake. This was powered by tidal flow in a period when sea-level was dropping. Six new mills were built along the new leat and leased to Sir Francis Drake on a 67-year lease (Bush, p.12; Hawkings, p.7). The town's people obtained their water from wells and springs. Mills were important in this era for the staples of life - bread and beer. There were few vegetables, the main food being meat and bread. Water was not needed for everyday drinks such as tea or coffee: the first documented reference to tea was in 1658 while coffee was available a little before that (source). Drake's new "leat mills" comprised of two at Crownhill (the Widey Mills) and four in the town (the Town Mills) - the latter included the Higher and Middle Mills and the Malt Mill. Drake's Mill aka Drake's Place Mill was the first flour mill that he built along the leat, sited just below Drake's Place Reservoir. Adjacent to this, in the now-Drake's Place Gardens, was a bone mill (Drake's? ), this crushed bones for making glue. Next door to this, on the site of Sherwell Church, stood Drake's Old Town Mill aka Higher Grist Mill. Next along the leat was Drake's King's Mill aka Middle Mill aka Lower Grist Mill. Then, came the Providence Mills, in the area of today's shopping mall (or close by), originally two malt mills but later they became a flour mill. Further along the leat was a tucking mill and on the line of today's Armada Way was a canvas factory. North of Frankfort Gate was a cement mill and almost west of Frankfort Gate was a tanning mill. As might be surmised, the old town of Plymouth was a busy place. (The source of some of this information was the sadly now-defunct Plymouth Data web site). Other money-making opportunities were seized by Drake in connection with the building of the leat. He was allocated £200 to cover its construction and another £100 to pay out in compensation to affected land-owners. He actually paid out £100 for its construction and £60 in compensation, making a profit of £140 (Bush, p.11). As a concession for bringing in the water, his rent on the old town mill was reduced from £40 to £30 per year. This writer is still unclear as to precisely which were the six new mills leased by Drake, the sources are not clear. Within two years of the leat being inaugurated, a "Plymouth Leat Mills Removal Bill, 1593" was put before parliament on behalf of mill owners on the River Meavy and Plympton Priory. They were losing both money and water to power their previously-established mills. The Bill went before the committee chaired by Drake with the predictable result that it was dismissed! Drake also influenced conditions attached to the building of the slightly later Stonehouse Leat - in that no mills were allowed to be built along it! The earliest record of inhabitants in the borough having water supplied is from 1608, 17 years later, when thirty-eight consumers were supplied from the leat. In 1821, there were some 800 users. The length of the leat is cited variously between 17 and 18½ miles - inscribed stones in a modern wall (below) state 17 miles. Careful measurement on maps indicates 17½ miles. Plymouth Leat originated at a head weir on the River Meavy, Mewe alias Meuye that is now buried under the Burrator Reservoir. The present head weir construction at the north end of Burrator Reservoir: link to Google Earth View of the area. The leat as it is seen a little way below the dam, looking back towards the dam. "Between 1591 and 1898 fresh water from the River Meavy flowed for 17 miles along Drakes Leat to Plymouth". The view on the other side of the road. Looking along Plymouth Leat, from near Yelverton towards Clearbrook, after heavy rains in Dec. 2012. Click the photo to see a movie. Tip: To see the movies at Full Screen mode, press F11 on your keyboard. Remember to press it again afterwards to return to Normal View. Plymouth Leat (normally without water) running across Roborough Common. Plymouth Leat on Roborough Common after heavy rains in Dec. 2012, looking towards Plymouth; the leat is running with water and adjacent areas are flooded. The normally dry Plymouth Leat running with water from drainage off the old WWII aerodrome (RAF Harrowbeer) at Yelverton. Click the image to see a movie. The movie starts by looking back along the leat towards Clearbrook and Yelverton, then it pans right to show a breach in the leat, then further right to show the leat dammed to prevent water flowing towards Plymouth (an anti-flood measure) with a clapper bridge beyond, then it pans back to the breach and follows the flow down the hill towards the River Meavy. The movie is best seen by pressing F11 to remove browser clutter. Remember to press F11 again to return to normal view. Notice board pertaining to Plymouth Leat: the other boards describe Devonport Leat and Crownhill Reservoir (built 1852, demolished 1999). Click the image to see a larger version. Disused Devonport Leat (according to a notice board on the Devonport Leat page (at page bottom) - the two leats (i.e. Plymouth and Devonport Leats) flowed close together here, in the B&Q car park. Previously somewhere here, the leat showed sections of granite setts and slate flags on the bottom (Hawkings, Plate 9, page 15). Notice in the gardens. Click the image to see a larger version. A Plymouth University notice. Click the image to see a larger version. Detail from the above notice. Inside Drake's Place Gardens, the reservoirs are behind the colonnade ...... Click on the image to see a larger version. Contrary to popular belief, this is not the last surviving length of Plymouth Leat. This stream was the waste leat from two mills that occupied ground roughly where the colonnade now stands, these being a corn mill (west) and a bone mill (east). These were powered by channels from the leat and then returned the used water back to the leat. The original leat is some 20 feet below the manhole located below the structure halfway along the left side of the channel in the photograph above, marked by the two sloping walls (Bush, p. 35). Beyond here, the leat was supposed to run to Sutton Pool but it was diverted to the Millbay area, now Millbay Docks. Records show in 1599/1600, that John Trounce was paid £2. 1s. 6d for altering the water course at East Gate (modern Coxside) where the leat was originally to discharge (Hawkings, p.13). Bush (p.12) records that the leat never went to Sutton Pool. The end of the waste leat in the centre of Plymouth. Drake's Reservoir, looking east towards North Hill at the far end. This is the last open reservoir in Plymouth, actually two reservoirs built in 1823 and 1828, are now joined together. It no longer supplies water. The leat was to terminate originally at Sutton Pool but it was diverted to Millbay. After many years of pipes being laid, properties being connected etc. it terminated here. The water is fed into the reservoir today by modern pipes. There is an ancient, traditional celebration of the bringing of the water into Plymouth that is still practised today - The Traditional Survey of the Waterworks and Fyshinge Feaste, believed to date from 1603/1604 (410 years ago. regarding the Survey) and 1696-1717 (296-317 years ago, regarding the Feast), this web page being written in 2013. Acknowledgement: The image of the first page of the Act of Parliament at the top of this web page was kindly provided by the Parliamentary Archives, without whose help I might never have found it, nor other helpful pieces of related information: I am grateful for their kind permission to display their image of the Act here.